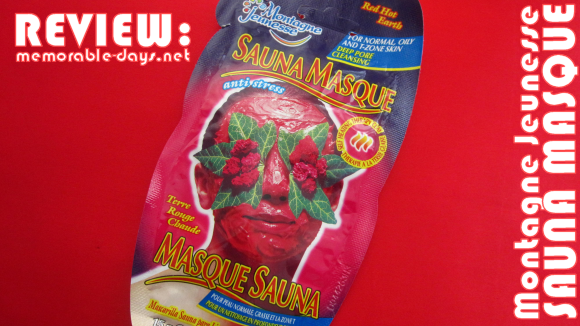 Review: Montagne Jeunesse Sauna masque | Memorable Days : Beauty Blog - Korean Beauty, European, American Product Reviews. I've tried a few masks from Montagne Jeunesse already and I was really curious about this one cause I had never tried a self heating sauna mask before. This mask is for normal, oily (t-zone) skin. Cleanse to the core with rich red clay & plant extracts; feel the heat help open pores allowing impurities to be drawn out, clearing excess oils without the mask drying, so your skin is left smooth & deep pore clean. You can only use this mask once. Thoroughly cleanse your face with warm water only and leave it wet. 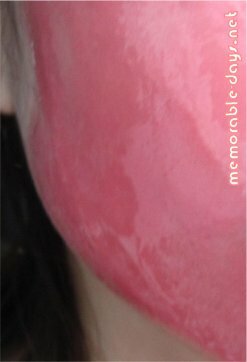 Apply the mask evenly to face and neck, avoiding eyes & lips. Leave it on for 5 minutes to experience the immediate warming effect and let the aromatherapy oils relax and d-stress you. Rinse it with water after those 5 minutes and pat your face dry. Use twice weekly. I don't like the scent of the mask it smells a bit chemical =/. On the packaging it says that it's clay but the texture is very creamy/watery and it is very thin. You can see that it's almost dripping off my brush and it really was dripping off my face during the 5 minutes when I had the mask on x_x". There is only 15g, 0.5 oz in this packaging and I only had a THIN layer on my face >.<" usually there is plenty of mask in it.. Such a pity =/. I had to tear the packaging open and squeeze the mask out. I didn't like the packaging of this mask cause it was dripping, I made such a mess in the bathroom because of this =.=". 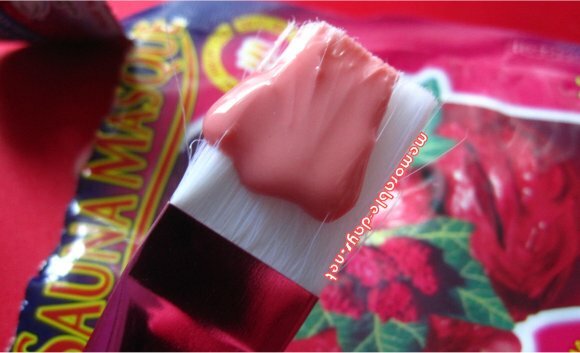 The color of the mask is pink while it says that it's a red mask on the packaging hmmm o__O'. When I applied it, I directly felt the self heating effect, it was warm o_o" but quite relaxing though~ I only had to apply it on for 5 minutes, which was very short, you can't really relax in 5 minutes right? Besides, the mask was dripping off my face =/, the texture was way too thin, it had a chemical scent and there isn't much in one packaging. It's not worth the money. My skin did feel soft after I rinsed my face, but it didn't clean my pores =.=". OH GOSH. THANK YOU FOR THISSSS! Jammer. Nee deze koop ik niet! @Lene, je gaat 'm ook freaky vinden die heat effect.. maar best cool =P lol.. maar was echt een irritante masker dit door al die andere dingen =.= BAD!